Our last event of 2017 was a stunning wedding at the gorgeous Stapleford Park on New Year’s Eve. 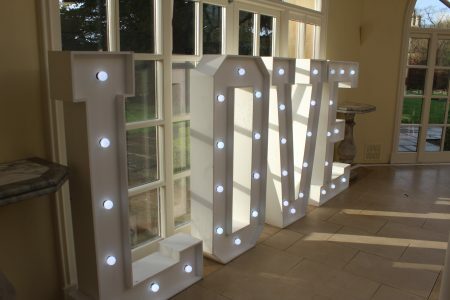 On the day we supplied everything from the limewash chiavari chairs and giant light up LOVE letters in the Orangery to the White Starlit Dance floor and Stage in the Great Hall… it really did look fabulous! Kelly & Henry originally got in contact with us back in October 2016 and since then Solid State UK have been there on every step of their journey. Unlike most the brides and grooms we work with, Kelly & Henry live overseas which could of made communication a problem but we were able to arrange meetings at Stapleford Park to help organise the big day and make it as stress-free as possible. Kelly & Henry’s civil ceremony took place in the Orangery which is a truly stunning room. 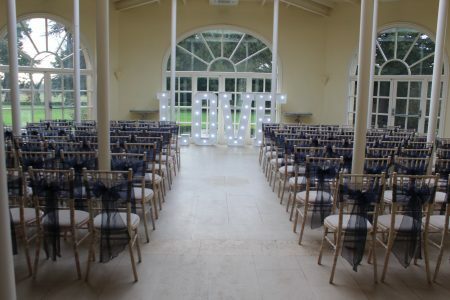 For the civil ceremony we supplied our beautiful handmade limewash chiavari chairs dressed in our navy organza sashes for all their guests, and at the bottom of the aisle stood our giant light up LOVE letters where Kelly & Henry renewed their vows. After the civil ceremony the wedding party moved into the Great Hall to celebrate. In the Great Hall we supplied our simple speeches PA system which included 2 x speakers opposite the top table and a wireless microphone which ensured all the guests could hear the speeches perfectly. 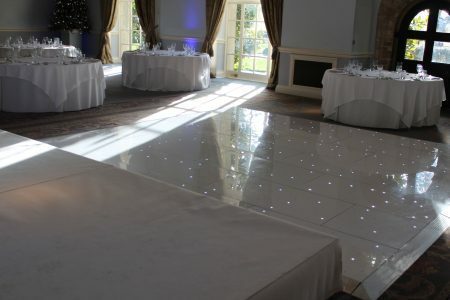 We also supplied our 14ft x 14ft white starlit dance floor, 4m x 3m stage with white carpet and casement and purple mood lighters which were scattered around the room. As midnight drew closer the wedding party saw in the new year dancing on our white starlit dance floor to the fantastic band who were rocking out on our white stage. In the early hours of 2018 all the guests re-joined the main house where we had our very own DJ waiting with his full DJ set up including LED booth and mood lighting. What a fantastic day it was, we’d love to take the opportunity to wish Kelly & Henry all the very best wishes for their future together! For some more fantastic photos from the day and a great blog written by the Sue who performed the marriage on the day click here. Thanks to everyone for all their hard work getting everything, the dance floor looks AMAZING! About to start an event like Stapleford Park (New Year’s Eve Wedding)?